This study, which was the first of its kind to investigate this association at a statewide level, was published November 19 in JAMA Pediatrics. The researchers looked at Washington state’s Behavioral Risk Factor Surveillance System data from 2013 and 2016. 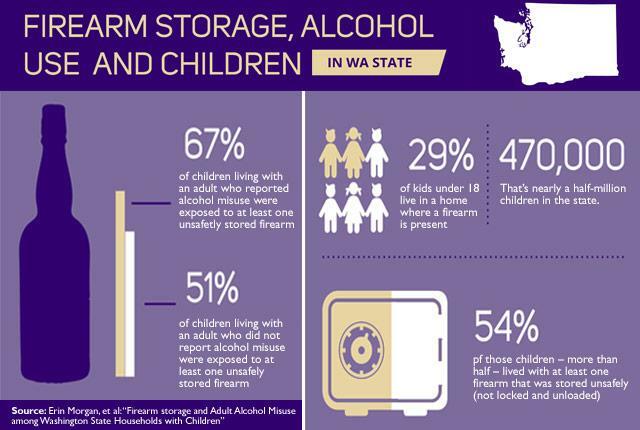 The 5,530 participants were asked questions regarding firearm ownership and storage practices through a four-question module after answering questions on alcohol consumption and sociodemographic characteristics about any children in their household. Contributing authors of the study were HIPRC Violence Prevention section lead Ali Rowhani-Rahbar, the Bartley Dobb Professor for the Study and Prevention of Violence and associate professor at the UW Department of Epidemiology, Anthony Gomez, Manager of the Violence and Injury Prevention Unit at Public Health Seattle and King County, and Frederick Rivara, professor and vice chair of academic affairs at the UW School of Medicine Department of Pediatrics. The study was funded in part by Grandmothers Against Gun Violence. Annie Pellicciotti, communications manager of the UW Department of Epidemiology, compiled this report.